This part of the Coquihalla Highway has severe winter weather. From Hope the highway parallels the Coquihalla River up to the summit (6 to 10% grades) and then follows the Coldwater River down to Merritt. 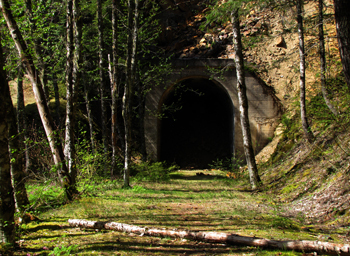 The Kettle Valley Railway Tunnel and Trestle at Ladner Creek are approximately 20k east of Hope on Highway 5. After 1k walk to the tunnel, the walking gets a bit trickier as there has been a tunnel cave-in. Use great caution walking up and over the tunnel. The views at the trestle are fantastic. "Coquihalla Lake and Needles Mountain"
"Tunnel" on the old K.V.R. There is a gravel road running through this valley that parallels the rail bed. Bar Creek. 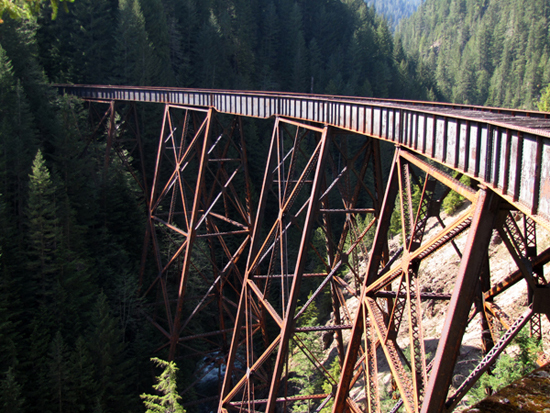 Although this is serious wilderness, it is an excellent bicycle route and has great views of the old Railway tunnels and trestles.